Watch our video demo to see how easy it is to get new lenses! Note, most lens orders are completed within 2wks. Your order confirmation will have more details and our office address (to send your frames). We provide free return shipping! Get assurance with our Rx accuracy guarantee. 1. We only provide industry standard, high quality lenses. This is important due to regulations and to ensure your best vision and comfort. *Note, polycarbonate lenses also block harmful UV light. 2. All frames are new, authentic and backed by our assurance guarantee. All though our prices may be low. Our standards are high. 3. When choosing lenses for your sunglasses. Know that polarized lenses will provide the highest level of protection and vision comfort. Only polarized lenses eliminate glare and enhance your vision (i.e. for driving, water activities, skiing, boating...). 4. Transitions lenses are light-adapting lenses which darken like sunglasses when exposed to sunlight/outdoors. These lenses will adjust to clear when indoors or at night. This is a great all purpose lens and gives you the best of both worlds without having to deal with two separate sets of glasses/sunglasses. Note, we only use authentic Transitions lenses. Transitions 7, are the most popular choice. These lenses are clear indoors and only darken outside with sunlight. 5. Anti-glare or anti-reflective lens treatment (AR), is very useful because this treatment makes your lenses look extra clean and clear. By eliminating annoying reflection off of the lens surfaces, AR treatment helps for driving, night vision & computer use. This treatment is always recommended, especially if you have a high prescription. Note, we only use premium AR lens treatments. 6. Extra thin (Hi-Index) lenses are recommended for all high prescriptions. Especially, if your prescription is greater than 3.00 diopters/power. Note, our Seiko Ultra Hi Index 1.74 lenses, are the thinnest on the market and include AR lens coating for the ultimate lens package. To dot or mark your pupil centers on your lenses. Simply use are sharpie/marker. You may also apply a small piece of clear tape on the lenses if the marker isn't showing on your lenses. If there are no lenses/demo lenses already in your frames. You may send us a "selfie" (see image above). If you don't know your pupillary distance (PD), you may also use this method before sending your frames. will simply use the current bifocal height for your new lenses. 9. When it comes to frame size. The most important number is the lens width, often referred to as the frame size. This is first number seen in the diagram (50). This number is usually on the inside of your frame arm/temple, or inside the nose bridge. As long as you stay within 1-2mm of this size your good. Note, overall frame style may make a difference. For example, gong from a rectangular shape to a round shape will mean the lens/frame size will vary more. If you have questions, feel free to send us an email, chat or call. your total PD would be 61 (31 + 30). Don't know your PD? You may also, mark/dot the pupil centers on your current lenses/demos (see, marking pupil centers above). Otherwise, be sure to ask your local eye care professional. For higher powered lens prescriptions, it is more important to know the PD. 11. Need help adjusting your frames? You may visit your local optical shop or optician for help. Or check online videos (Youtube). - Oakley Flak (collection), Oakley Half Jacket, Oakley Quarter Jacket, Oakley Shadow, Ski googles, One piece shield type lenses, Ray Ban RB4173, Maui Jim: Banyan, Hapuna, Sandy Beach Costa Del Mar: Ballast, Austin, Rockport, Galveston, Straits or high wrap frames. Got more questions? Feel free to give us a call or send us a chat message anytime. 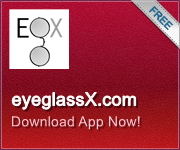 Did you know every time you shop eyeglassX, you get reward points in your account? Yup, these points accumulate automatically and can be used as real $$$. To take advantage of this benefit, make sure you set up a registered login account during your checkout. Your points can be used as a gift card entry during future orders. Earn automatic points with each purchase. You get 1 point for every dollar spent. gift certificate link and enter your code. Your discount will automatically be applied during checkout. Online chat (click icon bottom right of screen).